With university cannabis policies now in place, post-secondary students are faced with navigating an especially complex environment surrounding cannabis use. This story is a collaboration between The Ubyssey, The Gauntlet, The Fulcrum and The Charlatan. After nearly a century of cannabis prohibition, Canada is now the second country worldwide — after Uruguay — to make the drug legal at nationally, meaning that consumers of cannabis at Canadian universities are now in an unprecedented era of freedom. But for many students, university policies are tighter than expected and the future of cannabis on campus is still hazy at best. Many campuses have placed total bans on recreational cannabis use on campus, while a few outliers have taken a more liberal approach. Others fall somewhere in between. Considering post-secondary aged students are perhaps the largest users in the country, it isn’t surprising that university campuses have become a hot spot for cannabis policies. Data from Statistics Canada in 2012 shows that a third of 18- to 24-year-olds reported using cannabis in the past year, higher than any other age group. A 2017 study by Maclean’s sheds light on the consumption habits of post-secondary students more directly. About 37 per cent of all university students in Canada self-reported ever using cannabis. Students at Quebec’s Bishop’s University came out on top, with 60 per cent reporting having ever used, followed by Nova Scotia’s St. Francis Xavier University and Acadia University, which sit at 56 and 53 per cent respectively. 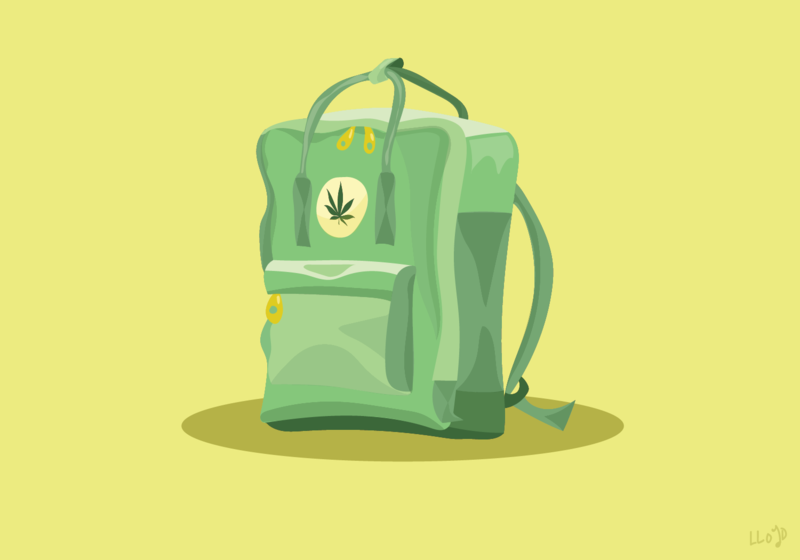 As a result, universities have looked to a mix of federal, provincial and municipal law for cues on how to approach consumption, storage and growth of the drug within campus boundaries. The Cannabis Act (also known as Bill C-45) is the federal law that now governs all things cannabis, allowing individuals over the age of 18 to consume cannabis and carry and share up to 30 grams. The Act will also allow Canadians to grow up to four plants at home and prepare edibles. But, as expected, not all provinces and territories are taking the same approach to legal cannabis. With university policies now in place as well, post-secondary students are faced with navigating an especially complex environment surrounding cannabis use. There were just two aspects of legalization that nearly all provinces and territories agreed on: a minimum age for consumption and whether consumers can grow their own cannabis at home. Prince Edward Island and the Northwest Territories have both followed suit with certain exceptions for public spaces. PEI will allow smoking in designated hotel rooms and campgrounds, while the NWT will allow public smoking when areas are not being used for events. Ontario, Nova Scotia and Nunavut will allow cannabis to be smoked in areas where tobacco can be smoked, along with private property. Quebec has taken the same approach, excluding university and high school campuses. Alberta and British Columbia have the loosest provincial restrictions of all, designating only cars, areas frequented by children and tobacco-restricted areas as illegal. To make things even more complicated, some municipalities have come up with their own rules for cannabis use within city limits, breaking the country up into a jigsaw puzzle of varying and conflicting cannabis laws. As university policies come into effect, campus regulations add an extra layer of consideration to the already complex policy puzzle. Many prominent schools across the country, including McGill University, the University of Calgary (U of C) and the University of Regina have completely banned cannabis, though their motivations for doing so vary. At McGill in downtown Montreal, administrators released a set of interim guidelines for pot use that rank among the most restrictive in Canada. Not only will McGill prohibit the smoking and vaping of cannabis on campus like other Canadian schools, but they also explicitly prohibit the use of all other forms of cannabis, including edibles and topical creams. — Stephanie Lake, CSSDP co-secretary and graduate student in the UBC School of Population and Public Health. Beyond Montreal, many campuses banning recreational cannabis consumption have cited restrictive municipal or provincial regulations policies. A similar policy emerged at the University of Calgary, with the school deferring not to the rules set in place by Alberta, but the more stringent bylaws passed by the City of Calgary that ban recreational cannabis use in public spaces. Some schools are still ironing out their policies. The University of Ottawa (U of O) decided on October 15 — just two days before legalization — to permit cannabis consumption in its downtown campus, though staff and faculty are still forbidden from consuming during workdays. This goes against other campus policies in the city, as both Carleton University and Algonquin College have placed total bans on cannabis use. Other universities are stepping away from smoking on campus altogether. Among them is the University of Regina, which became a smoke-free campus in August and simultaneously prohibited advertising or selling tobacco and cannabis products. The first smoke-free campus in Canada was Halifax’s Dalhousie University in 2003. After McMaster University in Hamilton announced a smoke-free policy in late 2017, other campuses quickly began to follow suit. At the U of C, administrators don’t plan to penalize students caught lighting up. Their policy says that those who report cannabis use in order to seek medical assistance won’t face disciplinary action. Even among campuses taking more liberal approaches to legalization, like the University of British Columbia (UBC), one guideline is consistent — students won’t be allowed to light up in their on-campus residences, which are typically considered units rented by students from their university. In most cases, including at the U of C, cannabis bans in residences are consistent with existing smoking bans. However, for some students, bans in residences and on campus, coupled with restrictive provincial or municipal legislation, leave them with no legal means of consuming a soon-to-be legal substance. The CCES is a national advocacy organization for drug-free sports that implements the Canadian Anti-Doping Program (CADP) in the Canadian sports community, including university sports. The CADP follows an international list of prohibited substances in sport enforced by the World Anti-Doping Agency that includes THC — the psychoactive part of cannabis that CADP says could give athletes an unfair advantage. As the enforced list stands outside of Canadian jurisdiction, this means that the ban on cannabis still stands regardless of legalization. Even as most Canadian schools and collegiate organizations move to ban pot, UBC is taking the high road. At UBC, students will be able to smoke cannabis anywhere they’re currently allowed to smoke cigarettes. And while they can’t smoke in residences or on residence property, they can keep it in their rooms if it’s clearly labelled. Unlike other Canadian schools, UBC acknowledges that prohibition simply won’t work — both because it’s impossible to enforce and because its students advocated for an educational, harm-reduced approach to legalization. “What I think we will see from the bans from universities that want to eliminate cannabis is that they won’t be effective and that they’ll simply force people to use cannabis is such a way that evades the surveillance of the institution,” said Dr. M-J Milloy, a researcher with the BC Centre on Substance Use. These concerns are especially pronounced at UBC Vancouver as it spans a whopping 1,000 acres. When drafting updates to Policy 15 — UBC’s current smoking policy — it was noted that banning cannabis would likely push users into surrounding neighbourhoods. “Compared to other universities we have additional complexities when it comes to implementing a full smoking ban,” UBC Legal Counsel Michael Serebriakov said. Similar concerns arose at the University of Lethbridge, which is designating five spaces where smoking and vaping will be permitted on campus, much like the policy that will take effect at the UBC Okanagan campus in Kelowna. Even in Ontario, which had adopted fairly strict laws around cannabis use, there are signs of change. The U of O announced this week it would be reversing an earlier decision to keep campus cannabis-free and “will allow smoking and vaping of cannabis wherever tobacco is permitted by law,” until a permanent policy is adopted in early 2019. The only exception is that faculty and staff are not permitted to consume cannabis during the workday — restrictions consistent with policies at UBC and other schools with lenient policies. “The University’s primary goal is to ensure that our approach on smoking and vaping cannabis on campus is reasonable, consistent with public health priorities and in the public interest.” reads a statement from the university. “There’s still some science to be done on vaping and its potential risks, but it does seem to present a safer profile than taking in the smoke and those carcinogens from smoking cannabis,” said London-Nadeau. Alternative methods of consuming cannabis like vaping could help users use the drug more safely — but universities like McGill and McMaster are banning these as well. Milloy also points out that a blanket ban on cannabis might impact "vulnerable populations" who use it for therapeutic reasons. "There’s no doubt that there’s people of the typical university age who are also using it therapeutically— to treat depression or anxiety and also as a substitute for other psychoactive substances." said Milloy. “The Supreme Court of Canada has recognized that Canadians have a right to use medical cannabis," said Milloy. "I’d like to see our institutions facilitating that right rather than trying to ban it." Ultimately, campus prohibition might be bound to fail before it starts. “If people see others just using and breaking those campus policies on campus, that just perpetuates what we’ve seen already with cannabis—which is a lack of respect for policies that aren't effective or realistic,” said London-Nadeau. A hotspot for potential cannabis use are residences, where universities have to balance their dual roles as educator and landlord — and where enforcing a ban on cannabis is uniquely complicated. Carleton University in Ottawa is one of many schools banning cannabis use in residence. Students of legal age in Ontario will be allowed to possess a maximum of 30 grams, but they will not be able to consume it in their dorms. Kyra, a Carleton residence fellow, said the department instructed fellows to not speak to the media after training. Her name has been changed to protect her identity. Kyra says residence fellows were told more specific training would happen closer to legalization. However, she said she is unsure about how to enforce rules with somebody who is drunk versus somebody who is high. “I don’t feel entirely prepared to deal with it, but I feel like the training from other aspects will definitely enable me to look at that situation,” Kyra said. The challenge for schools will be to inform students about the new policies. On the west coast, president of the UBC Residence Hall Association, Vandita Kumar, agrees.